The month of July is super exciting for me!! Not only am I home after a month of traveling, but I get to play around in my kitchen with my all time favorite ingredient – avocado!! So to kick things off this month, I’m sharing one of my all time favorite recipes for an Israeli Couscous Taco Salad. I make big batches of this taco salad all the time and leave it in my fridge for the flavors to marinate together over the course of a few days, and every time I’m hungry, I just serve myself a little portion and chop up fresh avocado to toss it. Pure perfection. And if you’re in need of some more avocado inspiration – I’ve got you covered. Cook the Israeli Couscous according to the package directions. Once cooked, remove from heat and set aside to cool. In a large bowl combine the red bell pepper, black beans, corn, scallions, cilantro, salsa and lime juice. Mix together. Add the Israeli Couscous and toss together. Season with salt and pepper. Taste and adjust lime juice if needed. Before serving, add chopped avocado. (I recommend 1 avocado for every 2 servings. I recently received some avocados from the farm that you and Matt toured here in San Diego..the Holtz farm and California Avocados Direct. Not sure if they work with the CA Avo Commission or if they’re “competitors”? But at any rate, I love my avos too! The California Avocado Commission serves all avocado growers…in fact, Ben Holtz (our son) is not only the founder of California Avocados Direct, but also serves as Treasurer for the California Avocado Commission at this time. 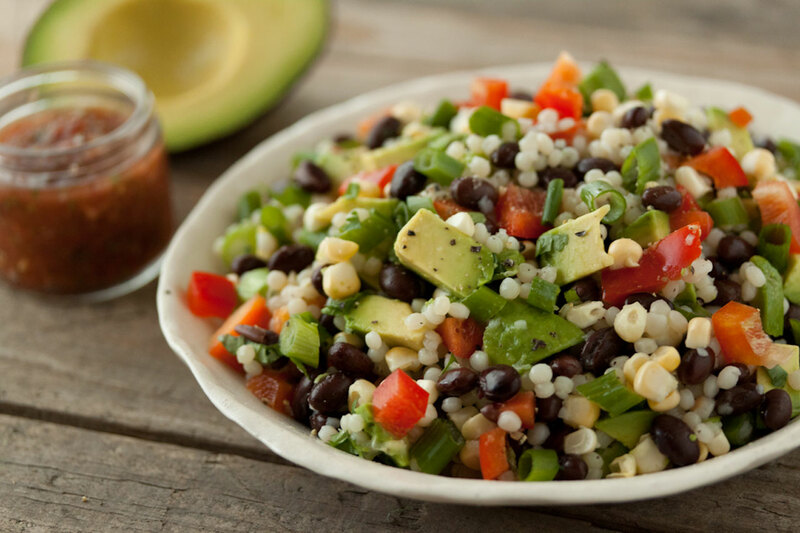 Love the idea of adding avocado to couscous… DELISH! i looooooooove avocados! 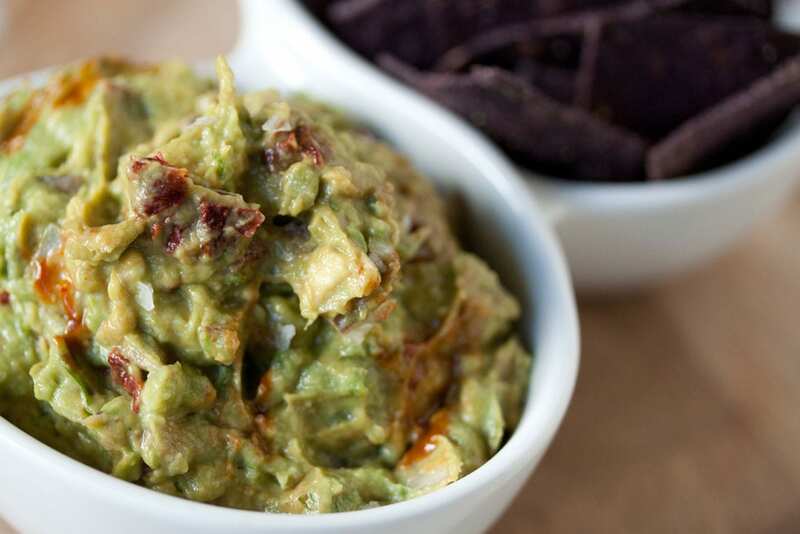 guac is probably my favorite, but i adore having them in salads and sandwiches and soups too. this couscous dish sounds phenomenal! This looks awesome! Super fresh and light for the summer. This just reminds me of why I love summer! We are addicted to avocados! I put them in just about every salad I have. And Israeli couscous is one of our favorites. My husband loves it, so we had dishes like this all the time. They’re so easy to make! Yummy! That looks so good! I wish I could find israeli couscous! I’ve looked everywhere and can’t find it, but maybe it’s because I live in a small town 🙁 Anyways, I love avocados so I’m curious to see future posts 😀 This salad looks so delicious! This definitely is a summer dish to me! I love making it with bulgur wheat as well, the avocados definitely are the star of this! 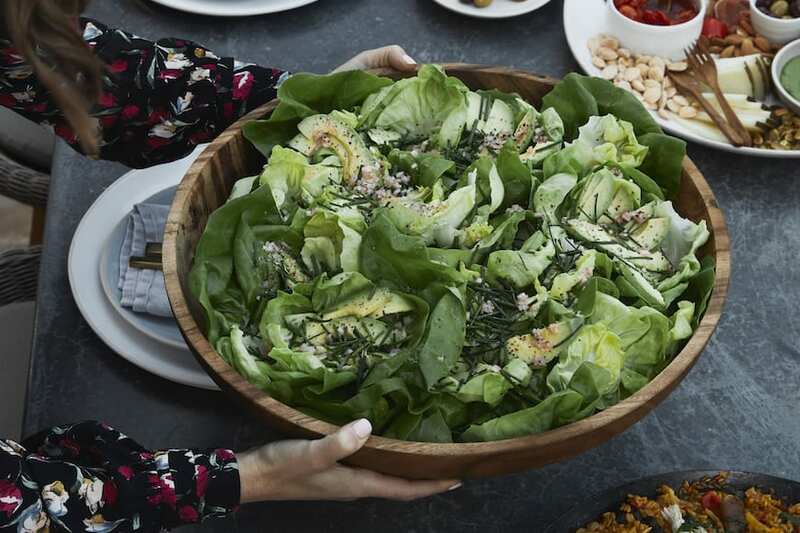 Love the refreshing summer salad! And couscous and veggies..yum. The perfect pairing – we are going to have to call you Queen Avo from now on! Thanks for this delicious recipe! I was just thinking about what to do with several boxes of Israeli couscous in my pantry…and now I have a great idea! Healthy too! I love the colors in this salad, Gaby. Have fun working with your favorite ingredient! I just love these flavors. The texture of the Israeli couscous makes it perfect for me, too. Of course, I’m kind of partial to Florida avocados. LOL! Lucky girl, avocados are so wonderful, I can’t wait to see what you do with all of them! I love avocados!! I’m addicted to guacamole. I love this recipe, Gaby. I have a bag of whole wheat Israeli couscous, I may just try your recipe! I love Israeli couscous and I love avocados! This is a win win! Congrats on working with the CA Avocoado Commission! It’s an honor! I love avocado’s too great source of monounsaturated fat and it’s an excellent source of vita A – both are great for beautiful skin! Finally got a chance to read this and I’m so glad I did! 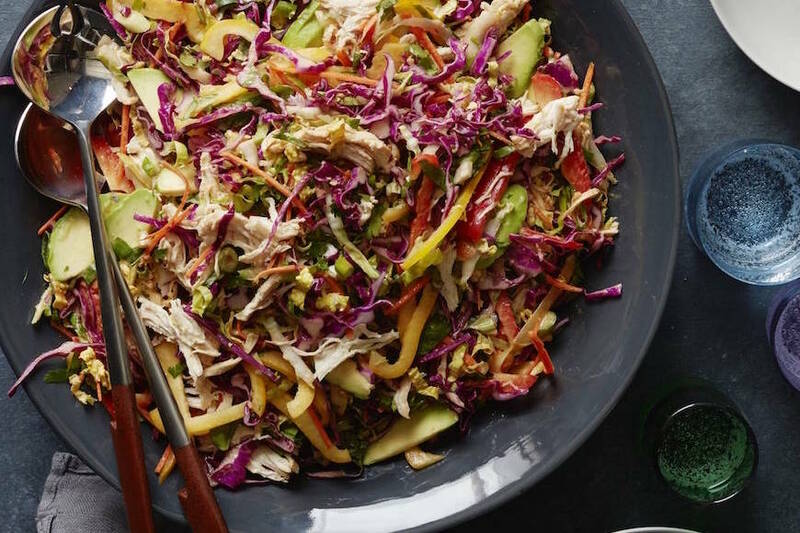 These are all the flavors I’m loving right now in light summer salads (and of course, avocado makes ANYTHING better!). Made this dish last night for dinner – DELICIOUS!! And super easy! Gaby, this looks amazing! Beautiful salad. Can’t wait to try! YUM! I want this right now. Yum! I never thing of combining Mexican flavors with Israeli Couscous, sounds tasty. You got me with the “really freaking good skin”. That’s it – more avocados for me! I love them anyway. 🙂 What a beautiful salad! Avocado food board couldn’t have a more perfect and enthusiastic representative. I’m so glad they finally came to their senses! You’re the best brand ambassador, ever! Anything with avocados is more than worthy of my taste buds. wow this is really calling my name! Great to meet you in Austin! Made this last night for dinner, it was fantastic! I used your salsa recipe in this dish. What a great combination of flavors! I will definitely be making this recipe over and over again. And for those of you who don’t have or can’t find Israeli couscous, I just used regular whole wheat couscous. Keep these great recipes coming! thanks!! I can’t wait to make this…it’s on my lunch menu next week when my sister comes…can’t wait! BTW…random…what plugin do you use for your recipes? I really like and am looking for something like it. Just made this to go along with my beer brats… delicious!!! Thanks! Couscous is so easy and quick to make! This recipe sounds like a great decorative way to serve it. Maybe I’ll do it on the side with quesadillas? This was so good I ate it all up within 24 hours. Now I’m going to make it again tomorrow and make a double batch. If I had some of that WHOLE WHEAT Israeli couscous, it would be perfect for my dietary goals, but it is wonderful the way it is.